Abbotsford, located in the Fraser Valley, is the fifth largest municipality in British Columbia, home to 115,463 people (2001). The population for the Census Metropolitan Area was 147,370 (2001). Abbotsford is situated immediately north of the Canada-US border, across from Sumas, Washington. 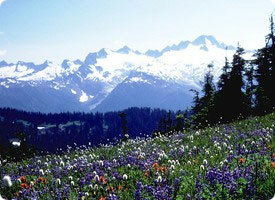 Most of the city has dramatic views of Mount Baker, a large glacier-clad volcano just across the border. The village of Abbotsford was incorporated in 1892. The village was named for a Maclure family friend, Harry Abbott, who was Western Superintendent of the Canadian Pacific Railway. The city was incorporated in 1995, through the merging of the District of Abbotsford with the District of Matsqui. Abbotsford is served by the Abbotsford International Airport, located in the southern part of the municipality. It is one of the fastest growing commercial airports in western Canada, and acts as a reliever airport for Vancouver International Airport. Several major airlines now provide regular scheduled service from the airport, due to its close proximity to Vancouver's rapidly expanding eastern suburbs. The airport is also the home of the annual Abbotsford International Airshow. Abbotsford has a long history of hosting major sporting events including: Western Canada Summer Games, BC Disability Games, BC Summer Games, National Waterski Championships, Western Canadian BMX Championships, Short Track National Trials, National Junior Baseball Championships, Canadian Mixed Curling Championships and the U18 National Open Volleyball Championships, just to name a few. The University College of the Fraser Valley (UCFV), founded in 1974 as the Fraser Valley College has become one of the largest university colleges in Canada, turning out over 1,500 graduates each year, and enrolling more than 10,000 each year. UCFV is now awaiting approval of university status, to become the Fraser Valley University.